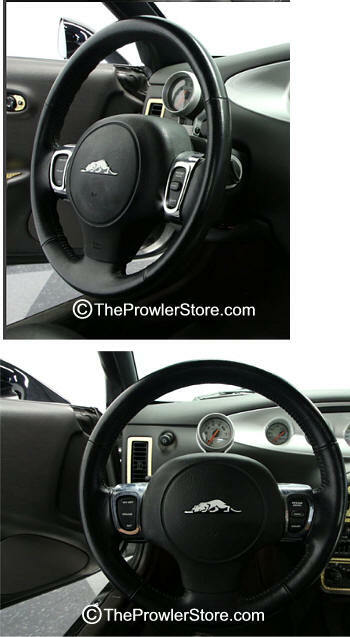 The finest highest-quality Prowler Interior Upgrade Set there is. 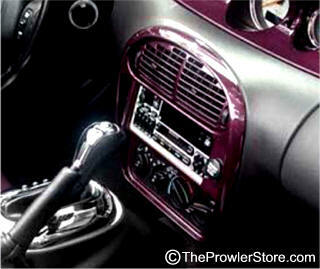 Brushed and High Polished Stainless Steel Professional Interior Dress-up package. 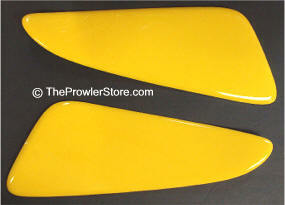 Fifteen (15) individual pieces that will make your Prowler into the show car that it should be. Each piece is two pieces of bonded stainless steel metal. The top beauty plate and the bottom trim reveal. 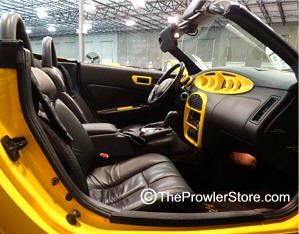 This is absolutely the finest quality most professional interior upgrade sold for the Prowler anywhere in the world. 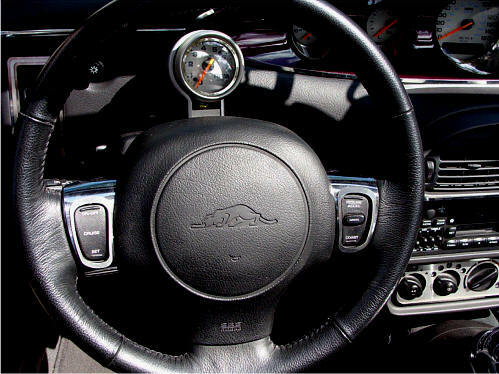 Turns your average interior into a real show car! Brushed piece set: Top plate is Brushed stainless steel and the bottom plate which forms a outer trim is Polished stainless steel. Stainless Steel with finish High Polished top plate and Brushed under trim plate reveal Interior Steering Wheel Control Trim Surrounds. 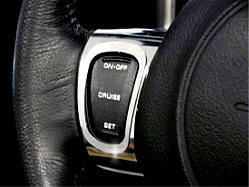 Comes 2 pieces one for each side of the steering wheel. Easy installation just peel and stick. Stays in place. Will not rust, corrode or ever lose its luster. 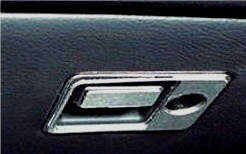 Polished Top trim and brushed bottom trim plate. 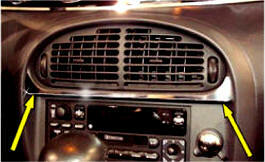 Stainless Steel High Polished Interior Radio Console Trim. 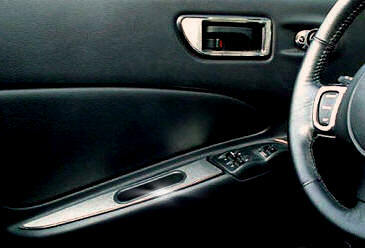 Stainless Steel High Polished Glove Box Handle Trim. 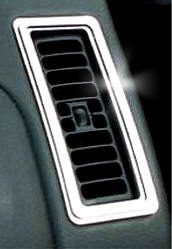 Button overlay and Handle Trim surround. 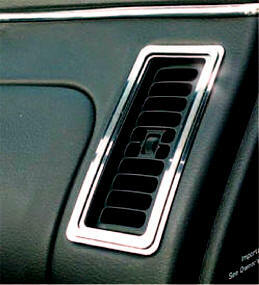 Stainless Steel High Polished top plate and Brushed Bottom Trim plate A/C Vent Trim Surrounds. This trim ring is a peal and stick with a Brushed stainless steel finish piece. 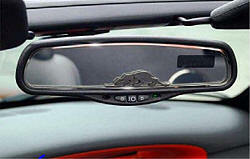 It fits right along the inner edge of your rear-view mirror. 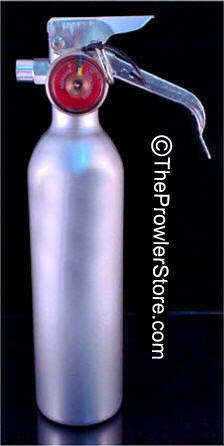 Made of pure Bright Shiny heavy gage Stainless Steel with a Brushed finish. Will not fade, stain or rust. This is for the lone speaker between the seats located on the back wall. 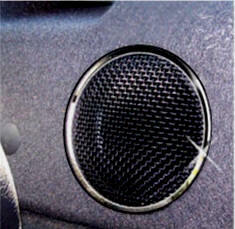 High-Polished Stainless Steel metal Speaker Trim. Really stands out! Stays shiny, easy to clean and easy to mount. Simply peel and stick. You do not have to remove any parts to mount. 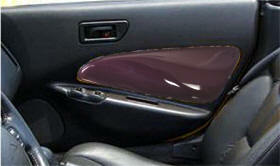 This fiberglass panel simply fastens to your door with automotive grade tape. 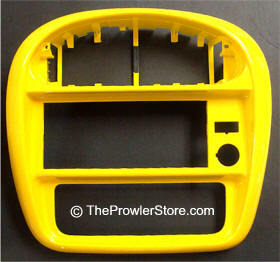 You may order the set in primer or any Prowler Car stock color. 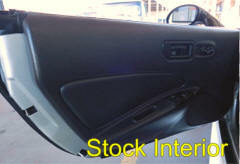 You're on your way to a matching interior. 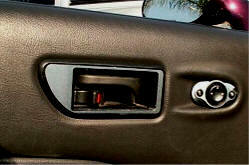 Comes ready to attach to the door interior via professional 3M automotive tape already applied. 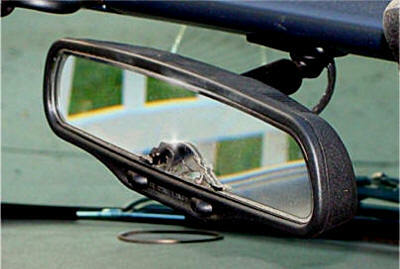 Easy to install - easy to remove with no damage to interior. 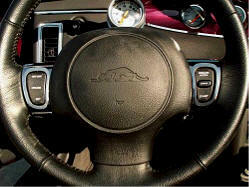 Check out our leather steering wheel wraps to match. 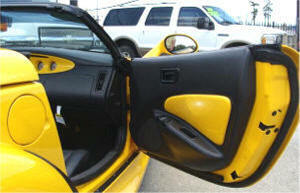 Note: You must thoroughly clean areas of your interior where you are going to stick the trim in this kit. Trim will not stick to oily or un-cleaned or Armor-all surfaces. Exact match factory color paint. 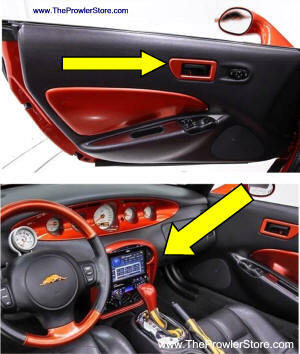 You send us your door handle bezels and or your Dash console trim and we will have them cleaned and professionally painted as received. Or by new parts and have them painted just ask us. 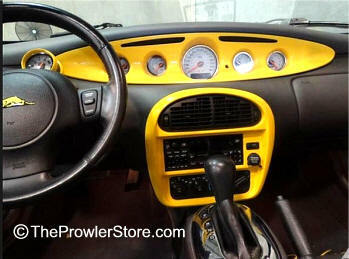 Shown are dash console bezel and door handle bezels painted to match factory color.